Recorded at the Cité des Congrès in October 2004. Beethoven won much of his early fame in Vienna not as a composer, but as a virtuoso pianist. A formidable talent, when he did begin to compose works for his own instrument, the results were spectacular and revolutionary. But for the most part, we remember him as the composer of the thirty-two great sonatas, the five grand concerti and the more expansive sets of variations such as the Diabelli and the Variations in c minor. What is sadly overlooked was his unique ability as a miniaturist. Usually relegated to student recitals and youthful piano lessons, there is a wealth of little jewels from the pen of the great master from Bonn, music that perhaps is brief and even at times simple, but beautiful and poetic just the same. 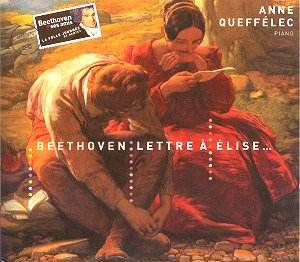 Perhaps we can thank the composer�s tendency to fall in love with every pretty girl he met for this bounty of charming, often dedicatory works that grace this delightful recital by Anne Queffélec. Opening with what is perhaps the most notoriously over-played and most often massacred piece in the piano literature; Für Elise is the bane of every piano store owner in the world. Alas and alack, because when played by an artist as elegant and graceful as Ms. Queffélec, it comes to life anew and regains its luster as a true poetic gem. Not heard as often as they should be, we are next treated to the variations on God Save the King, a work packed with little outbursts of virtuoso display, while at the same time being respectful of its English national importance. One of the great delights of this recital is the inclusion of the Andante favori in F major, a work that was excised from the Waldstein sonata, but having found such favor (no pun intended) with its composer that he published the work as a stand-alone entity and indeed programmed it on his own recitals with considerable frequency. It is truly a thing of beauty and Ms. Queffélec brings it to life again with great deftness. One wonders if the inclusion of the over recorded Moonlight sonata was some bean counter�s idea of a selling point. Although it is played here with great subtlety, it is a bit out of place in this recital of miniatures. That is not to detract from this reading at all, in which Queffélec demonstrates that she has plenty of melancholy (without going overboard) for the first movement, much ladylike charm for the second, and abundant pathos (with the technique to pull it off) in the third movement. Next on the program are the works which I personally think make this whole disc worth the monetary outlay. That is, the beautifully played survey of a handful of Beethoven�s charming little Bagatelles. Perhaps not the most technically challenging music in the repertoire, they still require a large measure of taste to make them appear as what they are: carefully crafted pieces designed to impress and charm the listener, usually a very specific one. The program continues with the famous Rage over a Lost Penny which although it is frequently assigned to students, is a work that requires a monster technique and when done well, is an audience pleaser deserving of its fame. To wrap things up, we have the Variations in F, although not as profound and difficult as the Diabellis or the C minor variations, still contain much to say musically and technically. I must confess that this is one of the most charming piano recitals that I have come across in years and it is a most welcome addition to my shelves. Having only heard Anne Queffélec in French repertoire heretofore, it is nice to experience this artist in a venture further afield. She has plenty to say, and all the tools with which to say it. Let us hope that we hear from her more frequently in the future.